Football Throwing Machines • Discount Prices • Free Shipping! Baseball and softball players aren't the only ones who need practice. Football receivers and kick returners need all the practice catching balls that they can get. Unfortunately, with team sports like football, there are only so many throws and kicks a quarterback or kicker can perform before they get tired. You can get far more passes and kicks per hour in with a machine. One of the best training aids a young football player can have, a football machine accurately throws perfect spiral after perfect spiral for hours on end and often farther than your team's quarterback can throw. It not only hits receivers in stride, some machines can also simulate punts and end over end kicks. Get the practice you really need and who knows? That extra practice time may just be the difference that prepares you for the NFL draft! Not sure which football machine to get? Scroll to the bottom of this page for additional information and frequently asked questions about this essential football training equipment. What's the Difference Between JUGS Machines and First Pitch Machines? Whether you are talking baseball or football, First Pitch pitching machines are, for lack of a better word, clones of JUGS pitching machines. First Pitch machines are red instead of blue but other than that, the only major differences between the two companies' products are that First Pitch machines cost significantly less money than JUGS machines and all First Pitch machines are made in the U.S.A. (JUGS Sports products are made in China). There are two JUGS football machines and one made by First Pitch. All of these football machines are named kind of backwards because they seem to do the opposite of what they are called. JUGS Field General: You would think a "field general" would encompass a whole lot of things but, in fact, this JUGS machine throws spirals only. It can snap passes accurately to receivers or "punt" spirals up to 50 yards. It cannot simulate endoverend kicks, however. 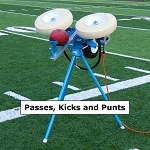 JUGS Football Passing Machine: Although the name of this JUGS machine would seem to indicate that it only passes footballs, it actually does a whole lot more. The JUGS Passing Machine throws accurately, of course, but it is also can do end over end kicks. What's more, this JUGS machine is much better at covering the entire football field. It can simulate passes, punts and kickoffs from 5 to 80 yards, meaning it is not only much better for passing drills with older players, it can create a more realistic hang time for punts and kickoffs. First Pitch Quarterback Football Throwing Machine: This machine is essentially a clone of the JUGS Football Passing Machine and yes, it is named inaccurately, as well. It can throw spirals for passing and punting ball drills but it is also a kicking machine, capable of simulating end over end kicks as well as spiral punts. Like the much higher priced JUGS football passing machine, the First Pitch football machine throws passes or kicks up to 80 yards. How Much Do Football Passing Machines Weigh? Like most 2 wheel pitching machines, all football machines are pretty heavy. The JUGS Field General weighs 97 pounds, the JUGS Football Passing Machine weighs 127 pounds and the First Pitch Quarterback Football Throwing Machine weighs 121 pounds. Needless to say, they are all pretty heavy machines and lugging them back and forth from the football or practice field can be quite a challenge. Fortunately, both of the JUGS football machines include a transport wheel that allows you to use the legs as handles and wheel the machine onto the field like a wheelbarrow. Unfortunately, the First Pitch Quarterback football machine does not come with a transport wheels. While some coaches use their strong, healthy players, having them carry the machine out onto the field, that's not not always an option for parents who want to work one-on-one with their kids. First Pitch does offer transport wheel carts as an add-on, though. You can choose the basic First Pitch Transporter, which resembles a two wheel hand truck. It attaches easily to the First Pitch Quarterback Passing Machine but it must be removed when using the machine. You might also elect to purchase the much more functional First Pitch Transporter Pro, which not only can be used with the football throwing machine still attached, but it has a basket that can hold balls and even has a towing package available for it. What Kind of Generator do I Need to Use with a Football Machine? 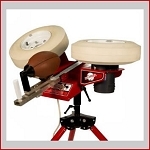 All football throwing machines operate on standard 120V AC electrical current. If you do not have an electrical outlet available or an extension cord long enough to reach it, you will need to use a generator with your machine. You can either use a gas generator or a 12V DC battery inverter type of generator, which converts 12V DC to 120V AC.